Although there are signs posted every where reminding doggie mom's & dad's to pick up after their pets, it is surprising how many don't. Even though there are plenty of poop-bag dispensers for convenience, the poop is not picked up. 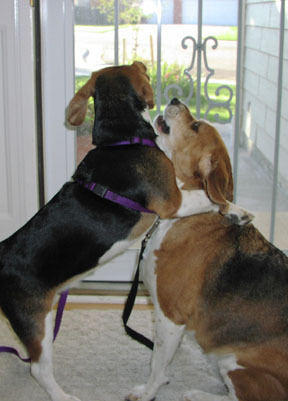 Their Colorado vet told me to pull the beagles away from poop left by other dogs. (That's no easy feat with these scent-hounds). He says that the poop can become a health hazard. Apparently there are several parasites that live in the the dog droppings. Dr. Rick told me that eggs from round worms can remain active for many years in the soil. Touching the infected soil and then touching your eyes or mouth can lead to an infection. This is why pregnant women should avoid cleaning litter boxes. It is my understanding that fresh poop is not infection, so disposing of it in plastic bags and dropping in the trash eliminates to the spread of parasites. Not only did we pick up after the beagles on our walks (we picked up other's dog poop too), we also picked up poop in our own backyard on a daily basis. We still do that in Lubbock. So be a good neighbor, keep your fur-baby on a leash when in public and pick up the poop. Now that we are in Lubbock and have a fenced in acre of land, Billy & Betty walk themselves. Every day, several times a day, they walk the perimeter of the property. That is to say, they walk around the fence and say "hello" to the horses and any passers-by. We really haven't found a place to walk them. If Lubbock has a leash law, it is not enforced - see a lot of dog roaming the streets.